Kung soldier - I was sooo excited about trying this. Spaghetti with kung pao chicken (宮保雞丁)! How cool is that? To my surprise the sauce was a little sweet, but that was soon overwhelmed by the chili. There's both the heat of the dried chili peppers - and there were a few in my bowl - as well as the fragrance of Sichuan peppercorns (花椒). Thankfully the latter wasn't very powerful, so my tastebuds were just on fire instead of being numbed. Throw in some green capsicums, onions, and some (kinda burnt) pine nuts in place of peanuts. But the nice surprise was the chicken! In addition to the stir-fried diced chicken, there were also chunks of popcorn chicken. I thought having two different textures for the chicken was a real nice touch. Even Hello Kitty was impressed. Parma ham, arugula POP UP pizza - this was a simple yet delicious thin-crust pizza. The crust was decent, and all that was needed was slices of Parma ham and Parmesan cheese, and some arugula. Pretty tough to go wrong with this. Classic barbecued premium baby back ribs served with French fries and tomato salad with balsamic dressing - Hello Kitty wanted some meat, so we got half a rack of these Danish pork ribs. The pork was definitely tasty, but unfortunately it had been marinated with rosemary - my least favorite herb - and the barbecue sauce wasn't enough to cover up the rosemary. 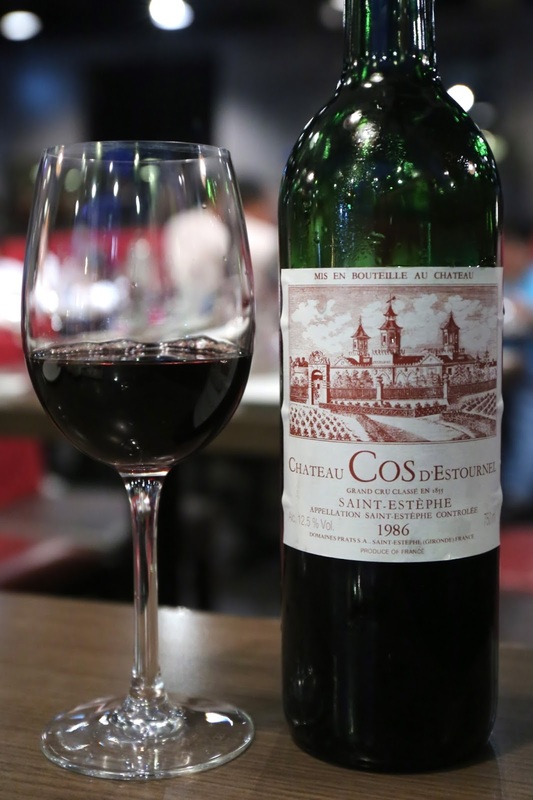 1986 Cos d'Estournel - double-decanted 50 minutes prior to drinking. Still plenty of fruit here like stewed prunes, a little toasty and cedar. But this bottle seems to be a little over the hill. I have noticed that quality from quite a few of these popular joints have gone up quite a bit. Actually my favourite pasta joint in HK is "Te", a Jap pasta joint with a few shops in HK. I think they have a shop in I-Square and one in Central near 擺花街. At least they do pasta al-dente.